Our Shay super king-size bed helps you get one step closer to your best night's sleep yet. 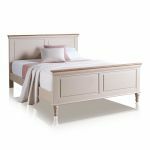 The body is painted a dreamy shade of almond grey, and the tops of the headboard and footboard contrast perfectly in our rustic solid oak finish. 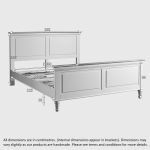 It boasts all the signature design details of Shay, including gently turned legs and delicate cornices on top, bringin a breath of fresh air into your bedroom design. 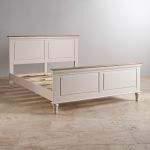 This super king-size bed is constructed from 100% solid hardwood - even the slats are made from kiln-dried hardwood for superior support and quality that will last for years to come. Complete your new bedroom set up with one of our fantastic mattresses, and browse our matching Shay pieces to create your dream room. Shop today!